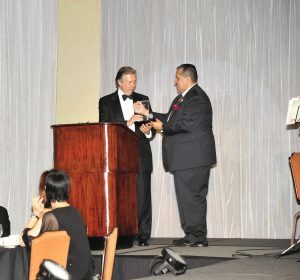 Hotel Oakland Village receives “Golden Heroes” award at the Family Bridges “50 Years Annual Fundraising Gala”! “Thank you so much! I would now like to recognize the true recipients of this award – the resident leaders of Hotel Oakland Village – would you please stand up. Thank you. I would also like to thank the Hotel Oakland staff for their continued hard work and dedication to the wellness of the Hotel Oakland Village residents, and my wife, Carolyn and colleague Megan for their lasting support over the years. Also, thank you to Corinne Jan, and the Family Bridges staff for their partnership and guidance along the way. Our story begins in July of 2011, when the Hotel Oakland Village was formed with a goal of reducing the negative health impact of senior isolation. Over the last 7 years, we have grown from 8 resident-managed Health Groups to 15 vibrant Health Groups with over 80% resident participation. In 2016, we also launched the Village Health & Wellness Connection, which provides seamless case management and healthcare services to our seniors as they age in place with a free, long-term “Wellness Plan” that is updated regularly along with 6 Interactive Wellness Discussions! This program has also been a tremendous success with almost 100% resident participation! We are delighted to report that since forming the Village, our residents have become much happier and less isolated. Our motto, “PARTICIPATION = GOOD HEALTH!” is truly exemplified in the successful health culture at Hotel Oakland Village that fights isolation daily. Please see the full article and photos on our Facebook page!